I only just recently hopped on the overnight oats train. I know, I’ve clearly been living under rock all this time. It’s the only way to explain my not having boarded a long time ago. But, I am now on board, and it has been full steam ahead around my house. I’m honestly not sure what held me back all this time. I’ve always liked oatmeal. I always eat breakfast. (Trust me, it’s not pretty if I don’t.) And I’m always looking for healthy options. So, absolutely zero reason to have not tried them. Anyway, I thought I would share one of my favorite recipes with you. It’s super easy and so delicious. Mix well, and leave in fridge overnight. This is best consumed the next day, but can be kept for up to 48 hours. If you like your oats a bit on the thicker side, go with just 1/3 cup of almond milk. If you like them a bit creamier, you can use 1/2 cup. And that’s it. 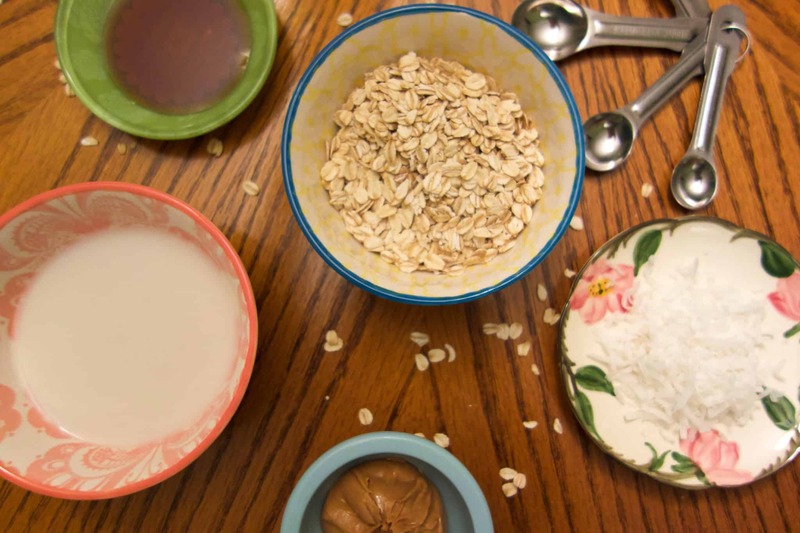 The great thing about overnight oats is that they are so customizable. Don’t like coconut? Leave it out. Obsessed with peanut butter? Add more in. Want to throw a few mini chocolate chips in? Go for it. Play around with the recipe, and try different things. With a base of oats, some type of milk, and a bit of sweetener, you can’t really go wrong with the add ins. So have fun! Bonus: I often double the recipe because my toddler (who is the stereotypical picky eater) absolutely LOVES these. If I don’t double the recipe, there’s often not much left for me after she has breakfast.